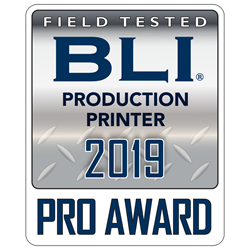 Konica Minolta and Ricoh Win Keypoint Intelligence - Buyers Lab 2019 Pro Awards | Industry Analysts, Inc.
Keypoint Intelligence – Buyers Laboratory (BLI), the world’s leading independent provider of testing services and analytical information to the document imaging industry, announces the winners of its coveted 2019 PRO awards, with the honors going to stellar devices from Konica Minolta and Ricoh. Granted annually, these awards acknowledge the products that gave the best performances in Buyers Lab’s rigorous production field tests over the previous year. This entry was posted in Konica Minolta, Ricoh and tagged BLY, Buyer's Lab, Keypont Intelligence, Konica Minolta, Pro Awards, ricoh by IA Staff. Bookmark the permalink. Next → Next post: Eric Taylor from Fishers is LD Products Gold Line Challenge Week 2 Winner!